'Intermission' - Oil on Canvas - 30" x 24"
Painting is my pleasure; indeed it is my life. I have been a full time professional artist for more than forty five years and I have enjoyed every moment of it. I am honored to be an elected signature member of the Society of Canadian Artists. My approach to painting is fairly traditional, but not always purely representational. I often combine very realistic elements with an abstracted view of reality. While sometimes dramatic, I generally strive for peaceful, calming beauty in my work. My love is creating quiet paintings, compelling subject matter and concise, elegant compositions. I was born and educated in Hungary, where I studied art and music. My family and I immigrated to Canada in 1957 after the Hungarian Revolution. In Canada, after a hard time like that of every new immigrant, I continued my career as a professional musician. 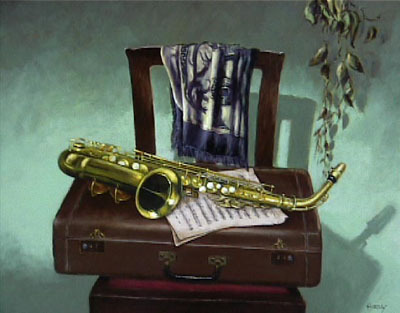 I played music at night and worked as an artist during the day but after several years fine art over-took music. During my artistic career I have won numerous prizes for my paintings in Canada and the U.S.
At this time of my life I feel confident that I have achieved a good measure of recognition as an artist and hope that people will continue to appreciate my art as much as I enjoy creating it.